One marker that meditation has been mainstream for a while now is that already in 2004 the Arthritis Foundation published an article titled: "Meditation: Imagine a totally natural treatment that can ease arthritis pain." As I write now in 2013 a search on the Arthritis Foundation webiste for "meditation" yields 2480 results! It seems "meditation" is now one of its most frequent treatment recommendations. Tthe Arthritis Foundation is a conservative, well-respected organization that can be quite hesitant to endorse alternative healing modalities. It is a powerful testimony to the power of meditation that this organization gives meditation such strong endorsements. Back when I first read that paragraph I found myself breathing a sigh of relief. It is important to me that the best medical care be available to people with arthritis. 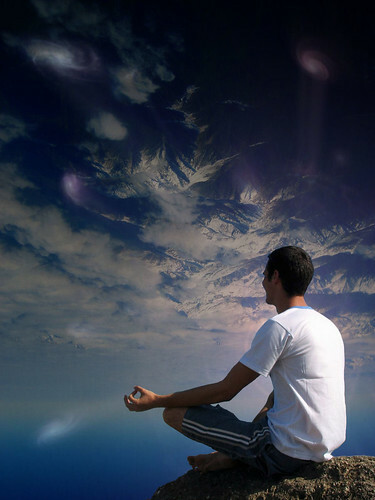 In my opinion, one of the most powerful and life-altering therapies available is meditation training. I am glad that doctors are finally recommending it. Without a meditation practice, I would probably still be using an electric cart to get around instead of enjoying walking, riding my bicycle and working out in a martial arts dojo. I whole-heartedly agree. It is difficult to name any other therapy besides meditation that has only positive side effects. I would also add, as the Buddhists say, “meditation is good at the beginning, the middle, and the end.” This means that you benefit, no matter what stage of healing that you are in. Pain as a Sacred Meditation? What if you are in severe pain? What if you have no way to make this pain stop? What can you do then? Early on in my arthritis I frequently experienced pain so intense it was difficult not to pass out. When I tried to walk more than a few steps my body would go into shock. Sometimes I would pass out. Sometimes I was able to stay conscious. Those moments of consciousness were a major turning point in my life. It wasn’t until I found Shinzen Young, who is now my primary meditation teacher, that I begin to understand what was happening to me. I have studied with him for many years. “All over the world in traditional cultures, men and women voluntarily subject themselves to pain as a vehicle for radical spiritual transformation. The Sundances and sweat lodges of native North America are examples of this. As cultures become more complex, the shamanic ordeals of the tribe evolve into systems of ascetic and contemplative practice. In this area, the qualifications for a competent guide are severe. The guide must be a person who has successfully used non-consensual pain to transcend their limited identity and unite with the source. Furthermore, to be a competent guide, one must have the creative communication skills to clearly convey to others how they could also do this. Barbara Allan's 6 CD guided meditation set for people with arthritis can guide through your own meditation sessions. I have RA too, according to an Arthritis Specialist. However, my homrones doctor told me that swollen joins could be caused by imbalanced homrones hence I can agree with the lost of a Love One statement as your homrones may change with the change of your life style and mind status.